Single cards to Sets. Pre-war to Post-war. We are interested in it all! We’re now accepting quality consignments for our February Sports auction. Our dedicated Sports department is always available to provide you free and confidential valuations. Call us directly at (800) 937-3880 or fill out the valuation form below. What do you get as an RR consignor? Experience, exposure, reputation, results. Let RR put more than 40 years of experience, international publicity and marketing, and our stellar reputation to work for you, achieving record-setting results. All sports consignments are welcome! 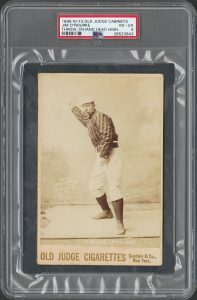 We’re always interested in seeing the best of your collection: Rare sports cards – pre-war, pre-1900s, post-war, more – game-used uniforms and equipment, original photographs, championship rings and more. 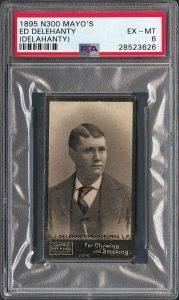 1895 N300 Mayo's Cut Plug Ed Delahanty PSA EX-MT 6. Sold by RR Auction for $16,414. 1888 N173 Old Judge Cabinets Jim O'Rourke PSA VG-EX 4. Sold by RR Auction for $11,644. 1968 Topps #177 Nolan Ryan and Jerry Koosman PSA NM-MT+ 8.5. Sold by RR Auction for $7,906.